Studious readers will remember that I moved to a new apartment only two months ago. Unfortunately, it wasn't meant to be - the basement leaked and I believe the house is riddled with mold and other environmental contaminants. Within two weeks of moving in, I was dealing with a constant headache, congestion, a burning throat, swollen glands, foggy headedness and fatigue. My Lyme and Babesia symptoms were flaring up, and I was starting to suffer anxiety attacks. I could barely function at work and had no energy left when I returned home at the end of the day. I finally resorted to spending as much time away as possible, housesitting for two weeks, camping for 5 days, and staying with friends for 2 1/2 weeks. Inevitably, after being away from the house for a few days, I would experience a total clearing of the additional symptoms. When I would go back, the symptoms would return. I knew I had to get out of that place for good; I've worked too hard the last 3 1/2 years to get to this point in my health, and I can't let my living situation drag me down. After negotiating with my landlord (and calling over the city inspector), I broke my lease and moved out. Now all my stuff is in storage and I'm staying out in the 'burbs with my aunt and uncle. This experience has opened my eyes to the importance of having a safe place to call home. I dreaded going back there each day, knowing that it would make me feel sick. Although staying other places made me feel physically better, it wore on me emotionally. I yearned for quiet, for privacy, for my normal pattern of cooking dinner and working in my garden and being able to rest whenever and where ever I wanted. After being on the move for the better part of two months, I am worn down and feeling drained. My lack of pattern made it hard for me to eat the way I need to and stick to my rigorous and ever-changing schedule of medications and tinctures and supplements. This wore me down even further, and made me realize that no matter what I need to put my health first and do whatever I need to do to stick to my patterns. I had always seen myself as someone with a strong gypsy streak, someone who is comfortable traveling and moving about, but I have realized that I need a space to call my own. Maybe that space could be a modern-day gypsy wagon, but I definitely need my own wagon and can't be solely reliant on the wagons of other people. I grew up in the heart of Wisconsin and now live in Minnesota, both unique places where people grill outside all year long. Even in the coldest temperatures, a true upper Midwesterner shovels a path through the snow to their grill, throws on a hat and a flannel shirt, and drinks a beer or brandy to stay warm while flipping burgers and tending racks of ribs. But for the fair-weather grillers of the world (people most everywhere else, I think), the warmer temperatures finally gracing the Northern Hemisphere officially kicks off grilling season. My dad has been known to stand outside in a blizzard for the perfect grilled shrimp, but thankfully, the whether on my trip back home over Mother's Day weekend was far from blizzardlike. It was in the mid-60s, sunny and lovely. Perfect for grilling! 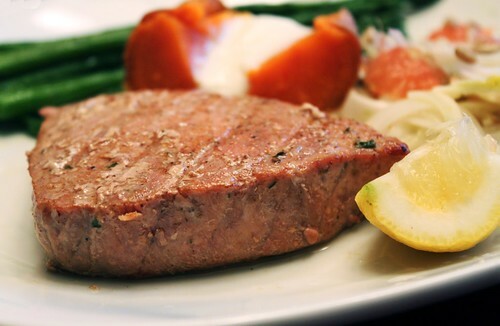 We found beautiful wild-caught sashimi-grade tuna steaks at Festival Foods for only $9.99/pound. The meat was bright pink and dense, and each steak was nearly 2 inches thick! We seasoned them simply and grilled them over pecan wood for a sweet, lightly smoky flavor. The tuna was perfect. 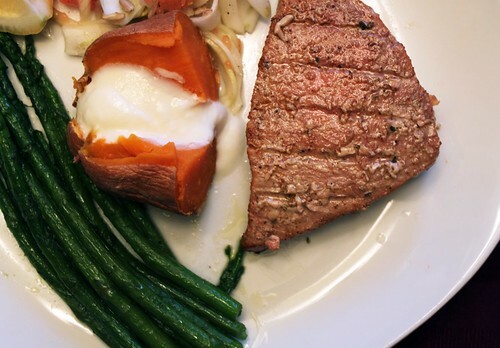 We served it with baked sweet potatoes, pan-seared asparagus, and a light and crunchy salad of grapefruit, fennel, and onion.. 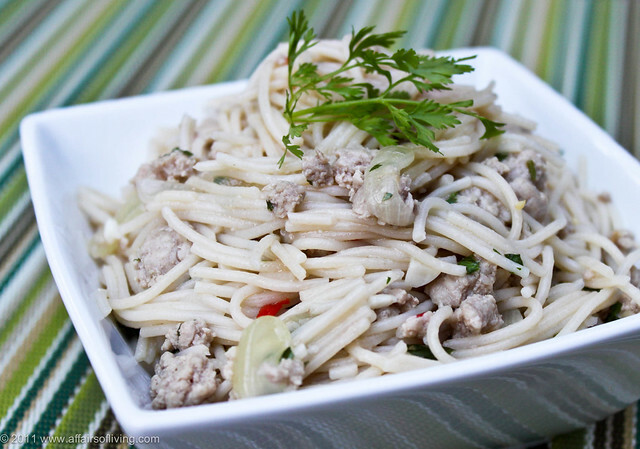 The meal was so easy to prepare and so delicious, I knew I wanted to share some of it with you. 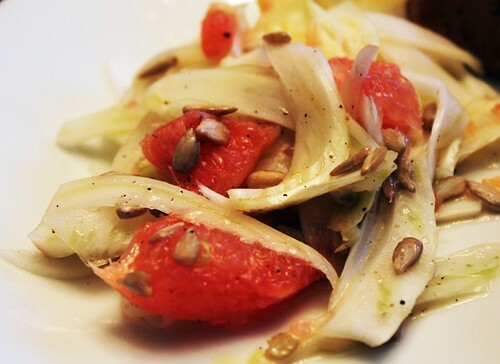 And thus, here are two recipes: Easy Grilled Tuna and Grapefruit-Fennel Salad. Whip out that grill, and get cooking! Q: What do you call the feeling of intense euphoria brought on by the consumption of well-prepared pork? I proudly take full credit for that dirty food joke. Mrs. Wheelbarrow and The Yummy Mummy, in partnership with Food52, are hosting a year-long blog event called Charcutepalooza: A Year of Meat. Using Michael Ruhlman and Brian Polcyn's Charcuterie as a guide, this challenge encourages bloggers to explore the world of salting, smoking, and curing their own meats. There is a big grand prize at the end that involves a trip to France and personal charcuterie lessons, but I jumped on the Charcutepalooza boat a bit too late to be eligible. A sad but true fact I can't escape. C'est la vie! My corned beef post from last month was featured by Food52 as one of the ten best blog posts for the March brining challenge. I'm honored! I adore Food52 and admire the work of the other bloggers featured in their round up, so I was thrilled to be mentioned. Be sure to check out Food52's recap of the challenge, as well as my post about making corned beef. This month's challenge is hot smoking. I became giddy at the prospect of trying a new recipe in a smoker. My housemates have a Camerons stovetop smoker, and since moving in I've gotten into the habit of using it at least once per week. 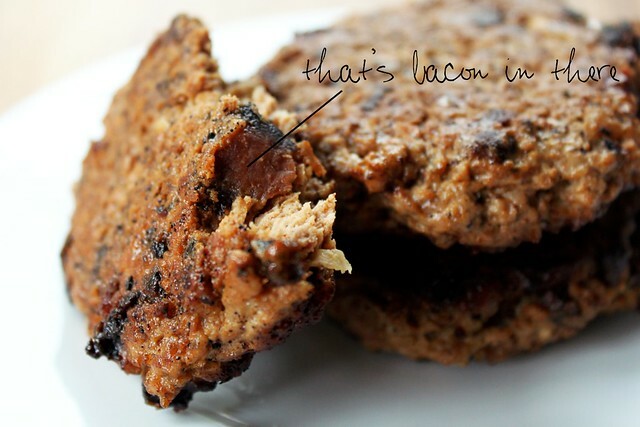 Smoked salmon paté, smoked hamburgers, smoked locally-made sausages, smoked marinated chicken breasts, the list goes on. I'm totally addicted to the food that comes out of it. 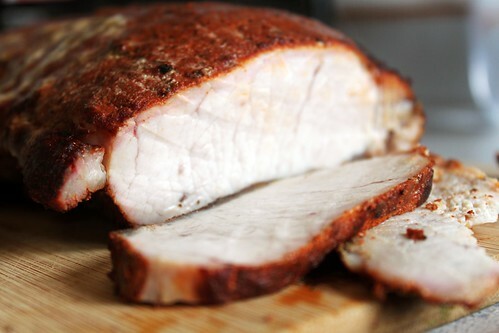 So, I went right for the gold and took on the Charcuterie Challenge of making Spicy Smoked Pork Loin from Charcuterie. Large cuts of meat intimidate me a little. Throw a pound of hamburger, a whole chicken, a filet of salmon, or a chicken breast at me, and I'm a champ. But place a rack of ribs, a leg of lamb, or a brisket in front of me and I'll have to pause and think for a minute. Or, more like twenty. And I'll have to look up recipes and look at cookbooks and give myself a pep talk. Then I'll begin. In my quest to conquer my fear of preparing anything weighing more than one pound, I'm reading books about meat and experimenting a lot in my kitchen with different cuts. 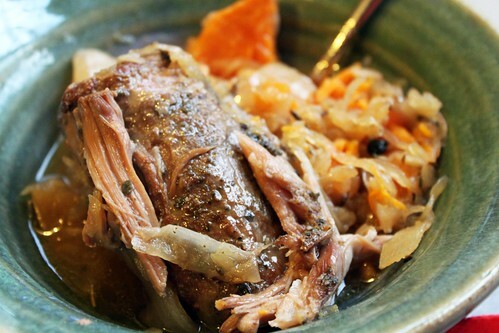 I'm on a major pig kick lately and decided to explore the world of slow-cooked pork shoulder. I found a beautiful pork shoulder at the food co-op, vibrant pink meat well-marbled with pure white fat. I'm not afraid of animal fat. Quite the opposite, really. I'm learning that when a well-marbled cut of meat is cooked low and slow, the fat will melt and keep the meat tender and infuse it with yummy rich flavor. Who can argue with that? Bring on the fat.